Is there a level of familiarity between you and your audience? Are you writing for colleagues or someone else? How do they expect to receive this message? Are they looking for some level of interaction? Are they more interested in being spoken to with direct messages? What’s their connection to the topic? Is it for their business/livelihood? Answering each of these questions will put you on course to figuring out how formal (or informal) your writing ought to be. An informal writing style shows a level of familiarity and personality that sets it apart. Meanwhile, formal writing most often takes place on serious topics in a direct and succinct way. Colloquial – Informal writing takes on the characteristics of a spoken conversation. Informal writing includes things like slang, figures of speech, broken syntax, etc. It also takes on a personal tone whereby you speak directly to your audience. You can use first OR third person point-of-view, and you’re likely to address the reader using second person pronouns (e.g. you, your). Simple – Short sentences are acceptable and sometimes essential to making a point in informal writing. Thus, there may be incomplete sentences or ellipsis to make points. Also, try to save your “five dollar words” for a more formal setting. If you use any industry jargon, explain it. Contractions/Abbreviations – Words can be simplified using contractions (e.g. you’re, couldn’t, it’s) and abbreviations (e.g. TV, photos) whenever possible. Empathy/Emotion – The author can show empathy toward the reader regarding the complexity of a thought and help them through that complexity. Complex – Longer sentences are likely to be more prevalent in formal writing. You need to be as thorough as possible with your approach to each topic when you are using a formal style. Each main point needs to be introduced, elaborated on and concluded. Objective – State main points confidently and offer full support arguments. A formal writing style shows a limited range of emotions. It avoids emotive punctuation like exclamation points, ellipsis, etc., unless they are being cited from another source. Full Words – No contractions or abbreviations to simplify words. Third Person – Not a personal writing style, the formal writer is sort of disconnected from the topic to make observations. So, which of these labels fits your writing style? Again, there’s no “right” or “wrong” answer, it’s an exercise to get you thinking about your own writing style. Leave a comment to share your thoughts and where you fall between the formal and informal styles. 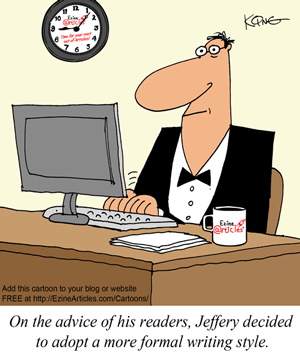 Formal writing is better when the author is uncertain about his audience. Especially for beginners this is better. Am I correct? Sreekumar – You are correct, it is always better to err on the side of formality if you are uncertain of your audience or unsure of your abilities to write in an effective, informal style. Informality bears the risk of potentially offending an audience, so use it only when you are certain of your familiarity with your reader. I`m leaning more towards the formal type of style myself. Ezines want thorough complete articles that are informative and correct in every manner so it goes to say that the formal style will be prevalent here. Unless you`re writing a personal blog, formal would be my suggestion on the way to write. I tend to use a bit of both, my niche is on relationship values and online dating, some parts of the topic, you can generalise on and other parts, I need to go with being formal. I guess it is a different preference for different approaches. Either style can work, depending on your skill level of communication and how you approach your topic. My article marketing is typically informal. My business writing is most often formal. Great explanations here. Glad you opened up this interesting conversation. I tend to the formal, but try and use informal on a semi-regular basis too. It’s good to remember that if you don’t mix and match at least a little, you’ll be cutting off a part of your audience from the start. Thanks for sharing us this topic. I am enlightened because today, varied styles are coming out, and as long as the writing conforms to the standards of basic grammar rules, they work. Yes, we have to know about our readers/ audience. And truly, there’s no right or wrong answer: we have to practice and enhance our own writing style. A blessed afternoon to everyone! Super explanations of each! As usual, Thank You once again! I generally speak to those, Loved ones I have not yet met, thus my writings weigh heavily on the informal. Such as: “Come on in and sit a spell, we can have some bread and jam and get acquainted!” Or perhaps, “Would you care for some Fusilli A La Roma?” Guess I’m just, down home, from the West. I enjoy Formal from others, as much as informal. There is a time for everything! Cheryl is right that there is a time for everything. The problem is slang differs, language transforms across territories. So the problem is informal will be restricted to a selected audience and no universal appeal. While this is true, informal writing does not have to contain slang at all. Mine doesn’t. Personally, I don’t like slang (Being a professional writer who respects words and language, I avoid all slang and profanities/obscenities and colloquialisms as much as possible.) but my writing would still be defined as “informal” because it is more casual, like a good friend giving you advice. I have readers from many different countries and all are capable of reading and comprehending my choice of words. I like to use both, depending on what I’m writing about. However, I do feel more comfortable when I’m using the informal mode. I tend to write more formal articles than informal ones. But even so on formal articles I sometimes try to create a level of interaction between me and the readers. Most of times I do that to try and incite them to leave a comment or share their opinion with the community. Is that wrong? I think it depends, if I were to be a professional I’d write in a formal manner, however I think we’d connect with people better using an informal letter, as Lisa had said, being informal means a laid back and more relaxed approach, not including slang. Thanks for providing us these tips. Explain us if we want to sell our product online then which kind of article is good for us to write. Choosing an article type is more about understanding your audience than it is about what you’re trying to accomplish. You want to put yourself in the place of your audience and think about what it is they’ll be looking for in your article. If the information is of high value to them, then chances are they’ll read your resource box and click on your links to find out more about you and your product. I tend to use more informal style as if I’m talking to a friend because I feel it is easier to read and fosters familiarity and trust. The more educational the topic the more formal my approach becomes. If I am trying to explain something I want to say it as simple as possible. When I talk to someone I am not formal. That makes me sound like I am better than they are. I do like the information explaining the difference of each. Very interesting article. One that keeps one in some sort of suspended animation. What is my writing style? Can I do that which I am not used to? Or can I combine the two, depending on the circumstances? Any thoughts on these? Thanks for your article. I like to use a blend of the two myself also, however it really depends on the subject matter of course. I think informal is always the right choice. You want to create a relationship with the reader and in order to do that you need to establish a informal perspective on your writing. I think this is the most engaging style. But that is my opinion. I am writing a paper for my service learning class. We were asked to write about our own ideas of community service and our own experience, but stay in the formal writing style. I am having a hard time talking about me, without using “I” and staying formal. Any ideas? My interests are very narrow and I find it extremely hard to focus when I have to write about something that I am not really interested in… Is it possible to remedy this or will I always have troubles like these…? We recommend writing what your passionate about. We also recommend narrowing the niche you write in to find the specific audience that will be interested in your articles. It sounds to me like you have the perfect combination for article writing success. Write within your passion and interests, analyze your results, and refine as necessary. What exactly is “broken syntax”? I am so glad your article really helped me. I have found that my writing sounds sincere and flows easily when I use the informal method. I feel more confident with that as I write the way I speak and according to the feedback I receive, it is well received and appreciated by my readers.